And I ordered up some fabric for a churn dash quilt. This one will be a quick quilt for a good friend who is out with knee replacement surgery. Chop, chop. I better get going before he's all healed up! Sorry, no pictures. The fabric hasn't been delivered yet. For the second quarter, I hope to also finish an Aeroplane bag, a flower pillow, and my sister-in-law's chicken quilt binding. Apparently, when someone finds out you can bind by machine, they stop hand binding and just give the quilt to you to finish! The conversation went something like this, "Here. You do it. It's only been sitting for two years. I don't need it back soon." I guess my sister-in-law really hates hand binding too! 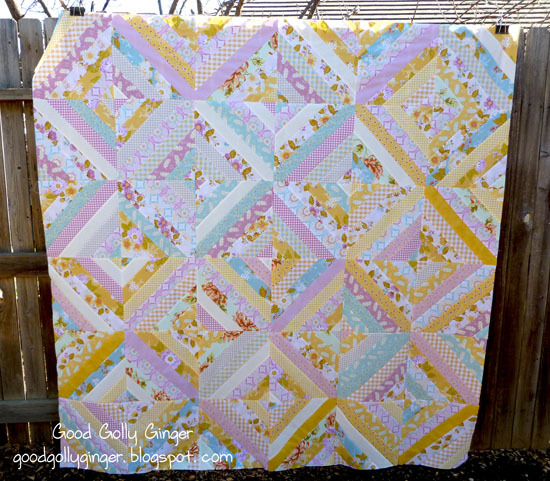 I love your Quilty fun sew along quilt, it's very different and original! I love the navy background, it's so cute! I'm really loving how the navy turned out too. It was a risk and turned out to be well worth it. Thank you for stopping by! I've always bound my quilts by machine (with two exceptions when the design of the quilts or binding made doing it by hand a necessity). I find it so much faster and when I'm that close to finishing, I appreciate getting it done that much quicker. If it would help, maybe try the "faux piped binding" technique --- it makes a very simple but fancier looking binding (another incentive for doing it and no actual piping used) and is even faster than a traditionally done zig zag machine bind. Trisha has a great tute here: http://tlcstitches.blogspot.com/2010/07/faux-piped-binding-tutorial.html. Per her instructions be sure to download the .pdf for clearer pictures than in the preview. Good Luck! Thank you so much for sharing. I've seen that, and it looks really good. Have a lovely day. 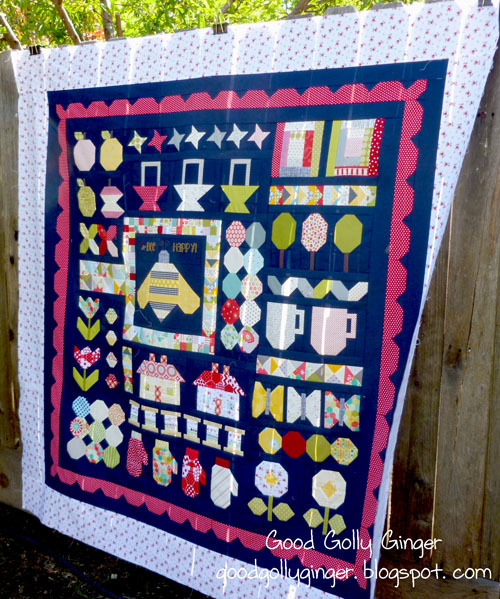 I ADORE your Quilty Fun Quilt, that dark background makes it just perfect!!!! Good luck on your list! Your Quilty Fun is wonderful, and the Hugs & Kisses top is so pretty. Good luck finishing!